Register with Accessibility Services when you register – It’s super easy. I made the mistake of not doing that last year. This year they helped me move from a hotel a mile away to a hotel right in the center of everything. This meant I could save my steps for the event and not walking to Moscone. Initially, when you register for Dreamforce it seems like it might just be a token nod to inclusivity. It is not. Even if you don’t feel like you qualify (imposter syndrome anyone? ), if you need a little help, check that box. As DF gets closer they will reach out to you and see what you need. Like helping me get accommodations that let me participate more fully. 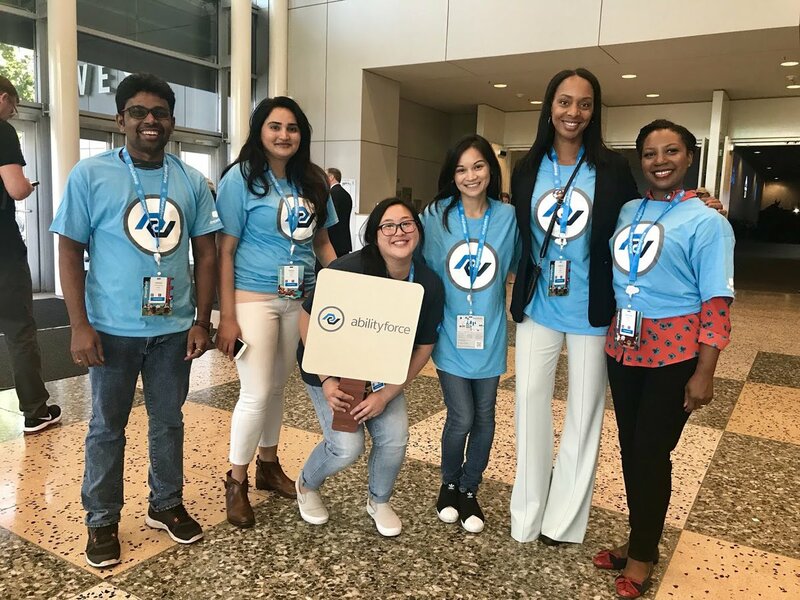 Look for the blue shirts of AbilityForce – these folks are A-M-A-Z-I-N-G! There really aren’t words for how awesome they are. And this year they were even more outgoing and present than last year. On day one of Dreamforce, through an unfortunate set of circumstances my timing was way off on getting lunch. Everywhere I checked was out. I hadn’t had enough breakfast to skip lunch, my snacks weren’t doing it, I was jet lagged, my blood sugar was plummeting, and I was basically a mess. Greg stopped me and asked what he could do to help, found me a bench, and then had another AbilityForce volunteer run to the last venue with lunches and bring me back some food and a soda. Instead of my boss getting a call that I had collapsed in the middle of the Dreamforest, I was able to eat, rest and make my shift at our both. If you need help, reach out to them! Seriously! They’re there to help. And they rock. Not to mention, seeing friends I made last year on that team was awesome! Plan your schedule carefully – You just can’t make it from Moscone to Westin St. Francis in 5 minutes. Especially if you have mobility issues. It is a lot less tiring to plan to be around 1 or two buildings per day or at least per half day. Give yourself time to get between rooms, especially if you need accessible seating. Be prepared to skip some sessions – This goes hand in hand with number 3. Even though you may have given yourself time, some times you just have to stop and sit in the Dreamforest. At the same time, I did drop in on a session or two because I was looking for a moment to regroup and sit down. You never know what you’ll learn when that happens. Have a good time – Dreamforce is about more than the sessions. So make sure to save energy for the evening activities. You never know who you’ll meet or what you’ll learn in those off moments. 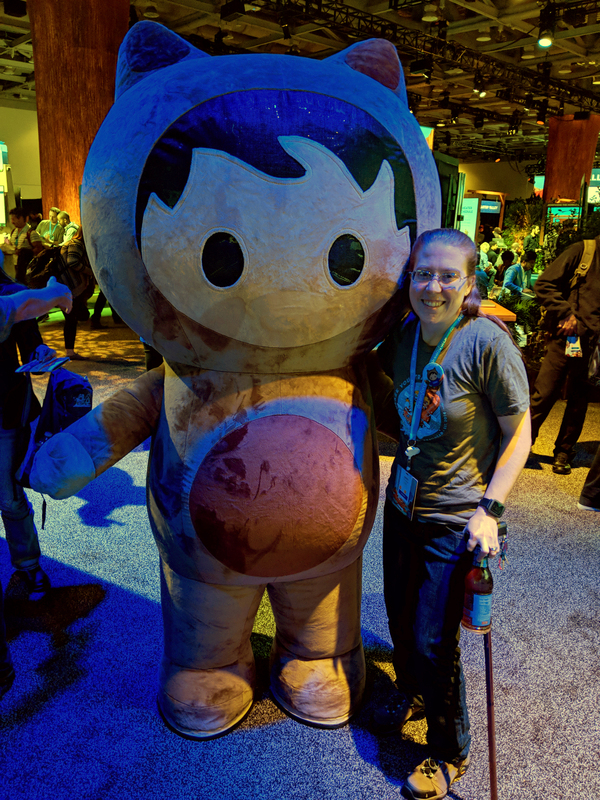 What are your tips for an accessible Dreamforce?